It's another 2012 closing as Jeff Partin at Fraser Yachts tells me he's sold the 32.97m sailing yacht Paraiso with John Perkins at Wellington Yacht Partners bringing the buyer. 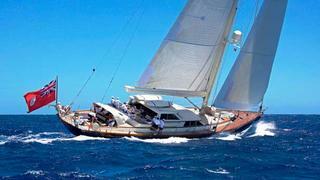 Built by Alloy Yachts in 2004 to a design by Ted Fontaine, Paraiso was refitted in 2009. Accommodation is for up to seven guests in a master suite, double stateroom and two twin cabins while twin 300hp Lugger engines give her a cruising speed of 10 knots under power. Fitted with all the latest communication and audio-visual systems, Paraiso was asking $8,995,000.